Rejoicing is a matter of choice. You are the only one who decides if and when you will rejoice. Below are 3 Biblical guidelines to help us rejoice in all circumstances. 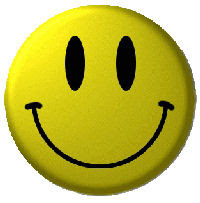 To be joyful is the same as to rejoice. The bible commands us to do things we can't do ... apart from Him. The word "continually" means without ceasing. We are to never stop. Similar to a pilot and control power relationship we are to be constantly open and receptive to communication from God. He is always available to us. Giving thanks doesn't happen naturally - it takes training. Just as children must be taught to say please and thank-you, we need to learn to develop the habit of thanking God in all circumstances. In Acts 16 Paul and Silas were accused, attacked, stripped, beaten and flogged. After all that they were thrown into prison and place in stocks. Yet they prayed and sang hymns. We need to quit whining and give thanks to God - we have so much for which to be grateful. Jesus kept his eyes on the prize. We also need to focus on what matters most. Jesus came to do God's will as shown in Heberews 10:7. We too can rejoice when we know we're right where God wants us to be. I Thessalonians 4:3 - It is God's will that you should be sanctified: that you should avoid sexual immorality. I Peter 2:15 - For it is by God's will that by doing good you should silence the ignorant talk of foolish men. I Thessalonians 5: 18 - give thanks in all circumstances, for this is God's will for you in Christ Jesus. If you wish you could do God's will - this is it. We need to remember that these verses are commands not suggestions or options. Such a lot of content for such a little passage. Hope to sew it tonight. I am thankful, really. It might not seem like it based on the number of posts in the last few several months. But that's not it. Life has gotten kinda crazy, kinda busy. Blogging has become a lower priority. Hopefully, this will change as new choices are made in the future. I have a renewed thankfulness for my husband. He has been going through a lot of changes in the last couple of years. After losing his job as an architect, he chose to take on a much lower paying job as a janitor at our church. It was humbling, yet fulfilling for him. He was sad to have to leave California and our friends their, but oddly enough he was also sad to leave that job. It gave him time to think - that is a wonderful thing for him. 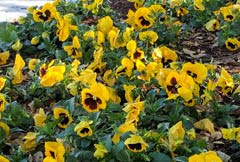 His next job was as retail salesperson at a nursery (with hopes of becoming a landscape designer). Even though the pay wasn't great, the opportunity to explore a long-held dream was wonderful. The step from salesperson to landscape designer has been challenging. And yet he is so thankful for this chance to pursue that dream that he is working through those challenges with diligence and commitment. As I have watched my husband make these changes and deal with the fluctuations in salary and hours, it has become apparent that he is committed to providing for us and allowing himself to be used by God in new and different (sometimes very uncomfortable) ways. In this month of thanksgiving, I want to publicly profess my thankfulness to my husband for his provision. But beyond that, he is a man who cares deeply for me. He's not one for mushy words and extravagant gifts. He would rather show his love in practical ways by folding laundry and taking me out to eat instead of watching me schlog through dinner preparations when I'm exhausted. He's a no-nonsense guy who can be my best supporter and most encouraging cheerleader. I'm seeing a side of him I never would have seen if we hadn't gone through the things we're going through now. I know even more deeply that he is fully committed to me and will never leave me. I will be forever grateful that he is mine and I am his. While I am very thankful that we were recently able to relocate to Texas, I don't think I will every get accustomed to the triple digit temperatures in our area. I am so looking forward to the cooling affects of September - at least I hope they will be cooling. Air conditioning is truly a miracle and a blessing. I am thankful for it in our car, our home, my place of employment and just about every other location I've been for the last 2 1/2 months. But...I'm ready to venture outside again. I long to stand in the sunlight without feeling like I'm getting an instant sunburn. I want to NOT sweat. I want to take a walk and have a nice cooling breeze blow through my hair. Ah, it's the stuff of dreams. I know, I know. I'm a baby. Dang right! Bring on Autumn. I'm beginning to think that Summer's only purpose is to help us appreciate more greatly the wonders of Fall. What other purpose does all that heat and dryness serve? Farewell August. I will not miss you or your heat. I am truly thankful to see you go. Last week was a week of many blessings. Blessing #1 - There has been some cleaning out going on at work (a quilt shop). 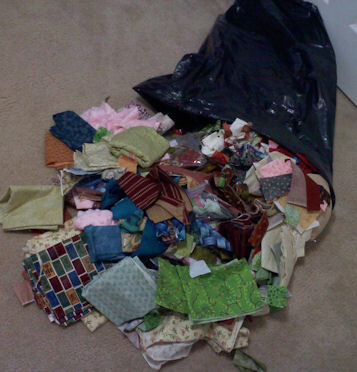 It was determined that some fabric needed to go and I was the very happy recipient of 2 yards. 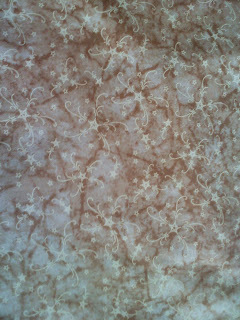 Blessing #2 - My friend/quilting gal (Dawn) has been cleaning out her sewing room and throwing away - yes, I said throwing away - fabric. Can you imagine? Neither could I. I told her in no uncertain terms that I would take that "trash" off her hands. When she brought me a 33 gallon trash bag almost full with fabric I was giddy. 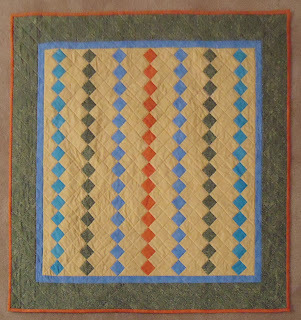 Blessing #3 - Another friend/quilting gal from my home state of California has a quilt pattern business. 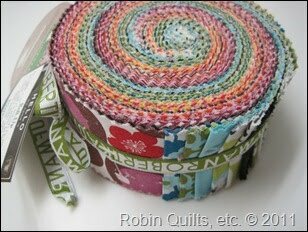 I follow her projects and life happenings on her blog, Robin Quilts, Etc. She was at Market last week and attended an event called Sample Spree. She had a contest on her blog and was going to gift one commenter with an item she picked up at Sample Spree. I was the winning commenter, so I'm going to be receiving a Robert Kaufman Roll Up in the mail soon. I am so blessed and very, very thankful. 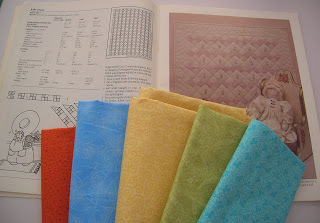 This is the 3rd block in the Romance Continues Block of the Month by Marti Michell. This picture is a bit blurry, but I actually think I like my fabrics better than those that come in the block of the month kit each month. I haven't shared those yet, have I? I'll save that for another blog post. I've also got a large quilt that I need to start binding. So far, the strips are cut and sewn together. Next is the ironing and attaching. And then finally, the hand sewing. 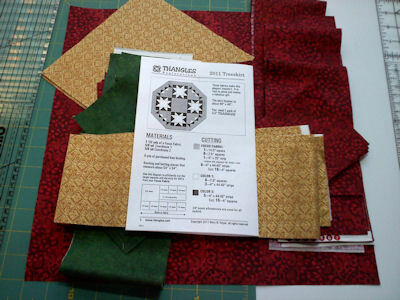 This is probably my favorite part of quiltmaking - it means another quilt is almost finised. And since my bff is coming to visit next month and needs to sleep under this quilt, I'd better get moving. Okay....I tried to log into my blogger account and couldn't. So I kind of panicked, thinking maybe I'd been hacked. But no...I was just using the wrong password or email or both. When did life become so packed with information? So full of content? So distractingly crazy. I could sit and read blog posts all day because there are just so many good blogs to read - couponing, quilting, cooking, etc. (By the way, spell check doesn't consider couponing a word. Yeah, right!) Plus articles on the latest news, saving money, celebrities and so on. And then there are the TV programs that I can access online. Oh yeah, add working on the budget to the list. Ahhhh...so much to process. And meanwhile, my backside just grows and grows. Must ... get ... control. 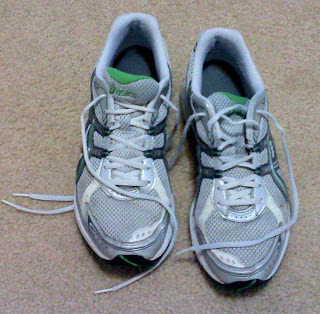 That's why I'm going to go for a walk tomorrow morning. I might not be fast, but at least I'll tie on the shoes and get in some steps. Right now the mornings are perfect for enjoying outside. While I'm at it I'll take the time to talk to God about all that I'm thankful for and all I need to entrust to Him. I'm looking forward to it. So ... if sewing soothes the soul, why don't I do it every day? Well, the answer is simple - time. One has to think ahead and plan a little so that when one has the chance one can just get going. I'm working on this, so that I can make good use of the snippets of time that appear in my life. Having goals also helps to make wise use of time. I have a dear friend coming to visit me in approximately 3 months. She will be staying in our "guest bedroom/husband's hobby room." The bed we have for this room is a futon (we hear it's hard as a rock, so we bought an egg-crate topper, but I digress). 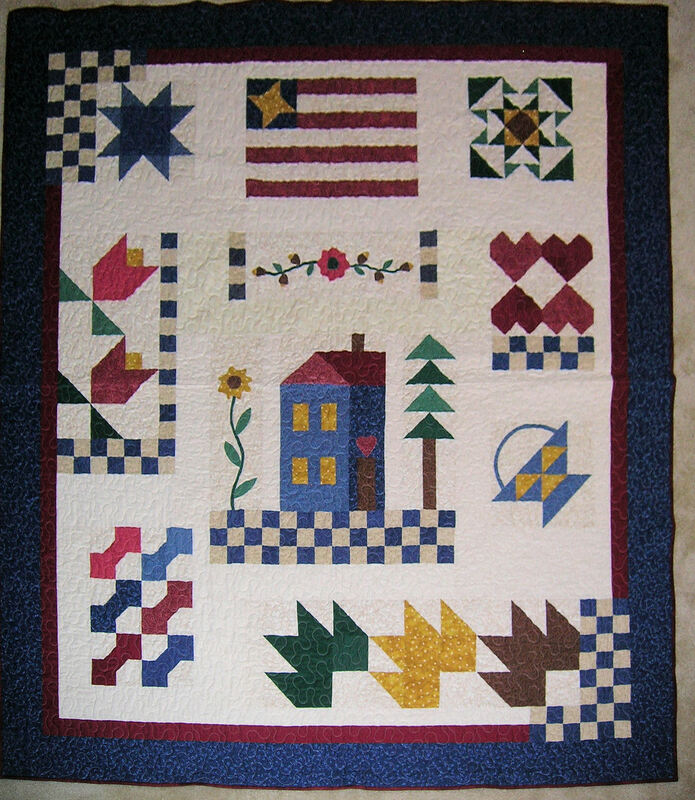 I would like for my dear friend to be the first to sleep under an Americana quilt that I hope to have complete at that time. 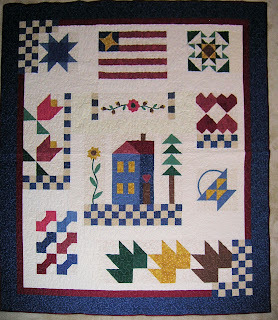 I bought the parts for this quilt in a kit series from Jo-Ann about 10 years ago. I thought it was so cute back then. Over time I grew to be less enamored with the quilt top. But as it's completion comes closer I am once again finding it attractive. The goal for this week was to contact the quilter and find out when she could pick it up. You see, this quilt is rather large and I'm a little out of practice when it comes to the art of machine quilting, so I opted to have someone else tackle this job. I was a little surprised when she told me she was available the next day, which is today. 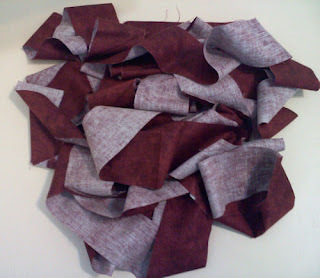 So last night, my next goal of seaming the backing fabric, was set for me. Here's a little peek of what the backing looks like. 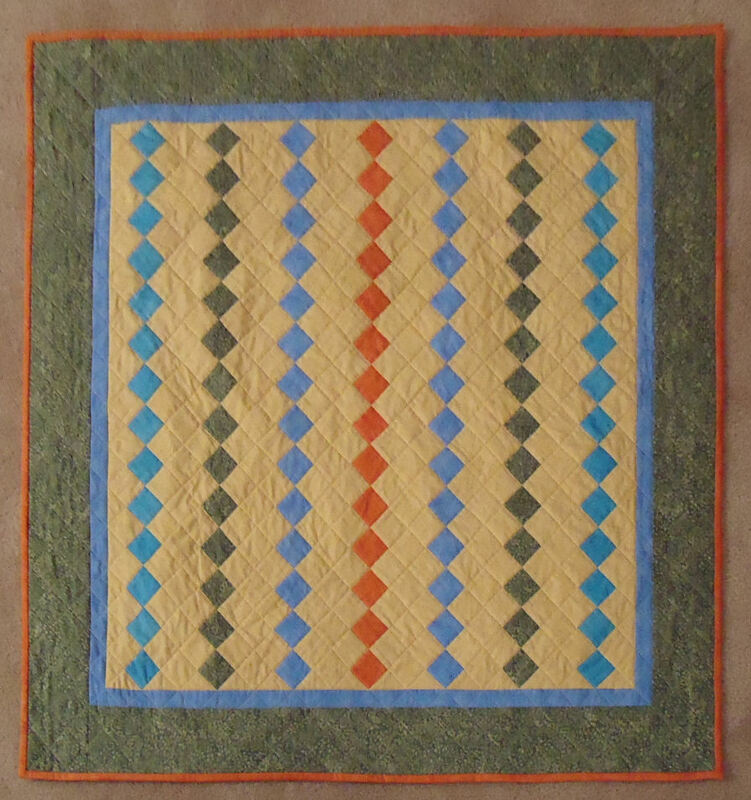 When I get the quilt back and have finished binding it (in less than 3 months, hopefully) I'll post a pic. I'm excited for this quilt to be completed and this goal to be met. But it didn't happen quickly. It took a little bit at a time. The days when I get to sew are the best days of all. 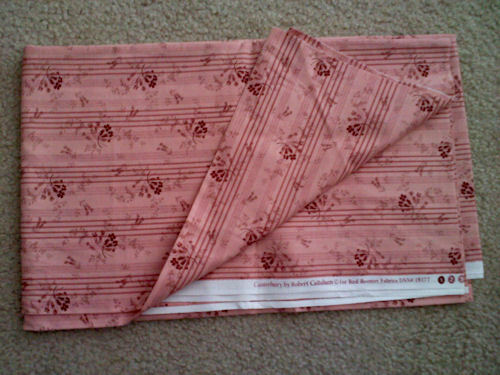 There's just something about sewing that soothes the soul. Not just any kind of sewing will do. 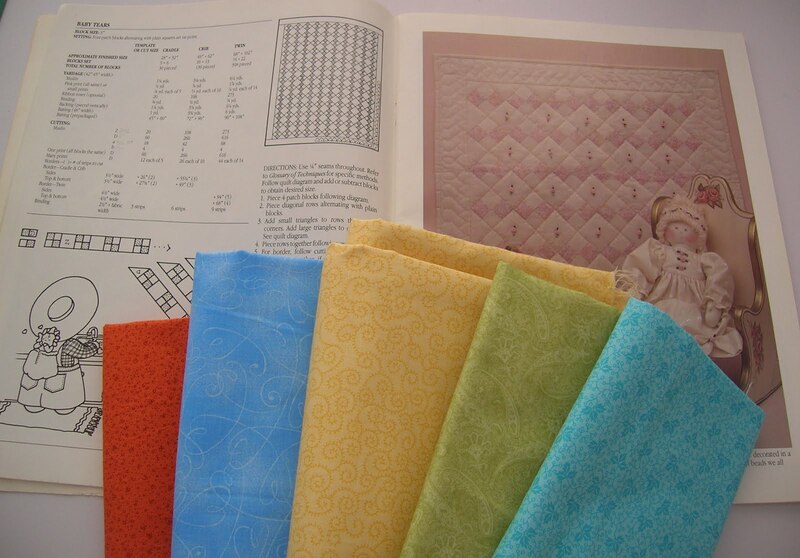 It's the creative/productive kind of sewing that we quilters enjoy. I'm currently in a new experience called a Block-of-the-Month. The quilt I am assembling is The Romance Continues, by Marti Michell. This quilt calls for templates - little plexiglass shapes that create perfectly cut fabric pieces that fit together perfectly and create the perfect quilt block. Well, being the cheapo that I am, I decided that I didn't want to purchase the templates and would try to create the blocks using some other, more standard, rulers. 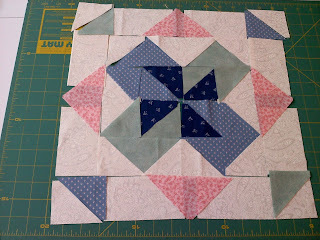 But before I actually make the block I'm supposed to be making with the fabric that comes as part of the block of the month program, I am cutting all the pieces out of some scrap fabric I have, to make sure that things will go together as planned. This is what I call fun. 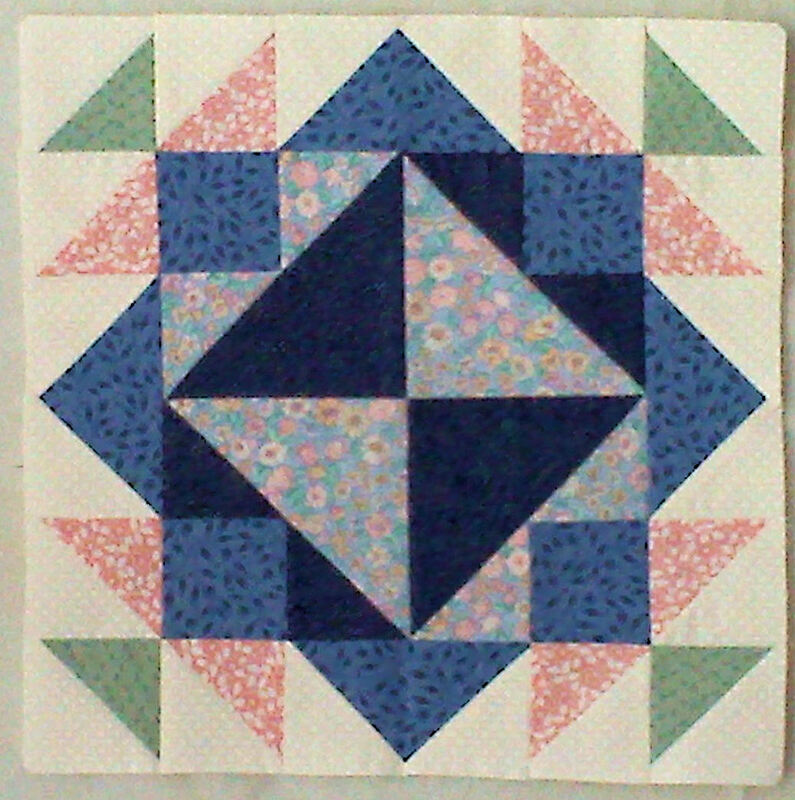 After I make the "trial block," I then go on to make the official block. 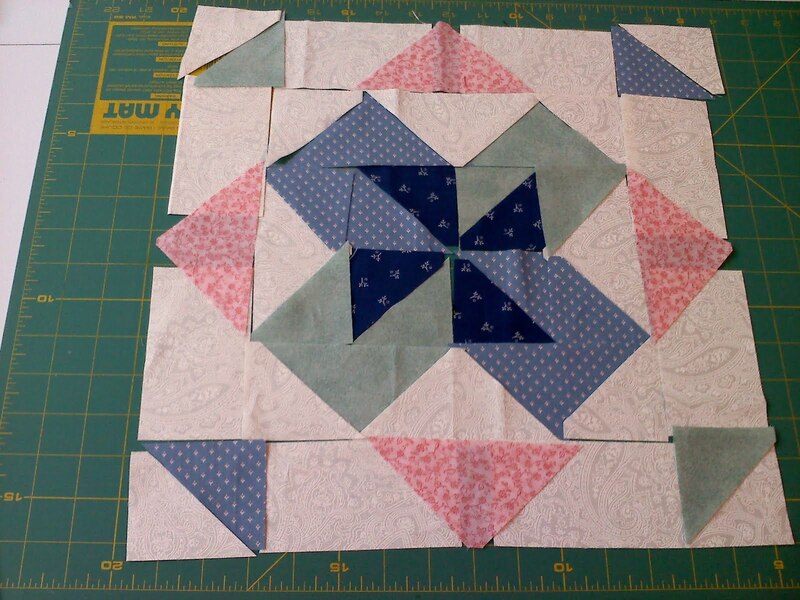 Today I cut out my trial block and laid it out to make sure I understand how the pieces to together. This is all I have time for today. This counts as sewing. This soothes the soul. Another day I will stitch them together. What fun! Fred and Johnny are two guys who made a difference. They both had what others would consider to be menial jobs. One was a postman and the other was a grocery story bagger. But both were genuine in their care for others. And that is what makes them special. Read more about Fred here and watch this video to see Johnny's story. What you choose to focus on is so important that it can spill over to how you treat others. If you want your interactiions with those around you to be positive then take time to make sure you are getting that positivity into your psyche. Read books about thankfulness, success and overcoming challenges. Listen to motivational audio files. Go to church. Study people in your own life who are upbeat and hopeful. Take cues from others who have mastered the art of encouragment ... like Fred and Johnny. Say something nice to someone today. If I have so much to be thankful for, then why have I only written one blog in the last year or so? I think that I sometimes have difficulty acknowledging publicly my belief in God's provision for my needs. And yet, I wholeheartedly believe that all I have is from God. It is much easier to complain about all I don't have than to take the efffort required to focus on the many blessings I do have. It just seems to be human nature (at least for this human) to gripe. And yet, I know that it is better, for many reasons, to focus on the positive. Today I am thankful for Allrecipes.com where I found the tastiest Barbeque Chicken Salad recipe to have for dinner last night. We didn't have all the ingredients on hand, but I was able to zip into our local Target and quickly grab them. Zipping into Target was an option because, in a surpising twist, I got off work early yesterday. After dinner there was time to watch some TV with my daughter (Diners, Drive-ins and Dives) while working on my hexagon quilt. 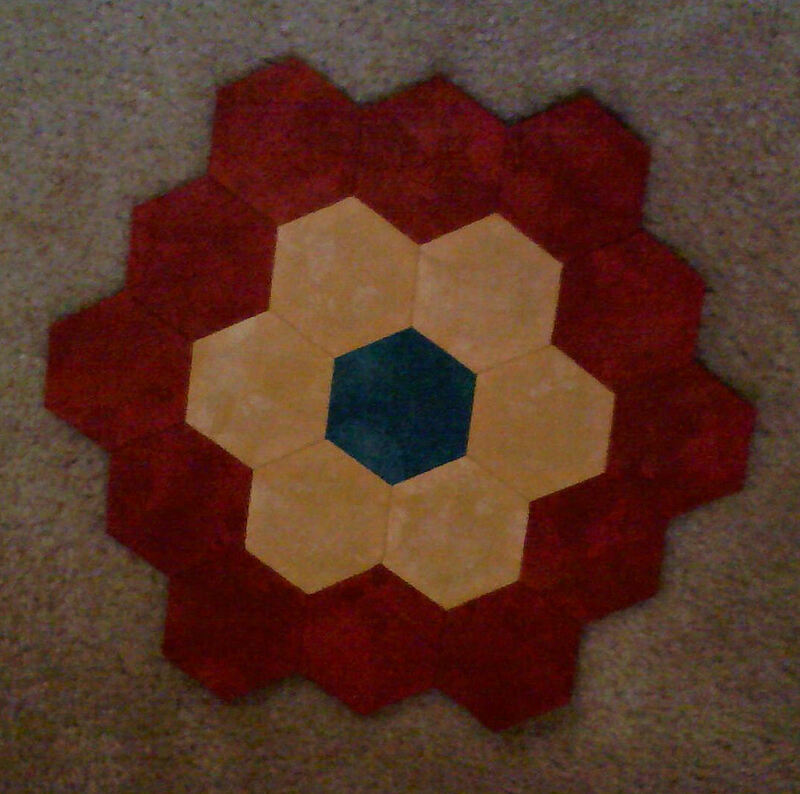 Another flower is complete - Yay! Hopefully this will be the beginning of a renewed focus on thankfulness. Stay tuned.